A common issue I come across in many of my clients homes are tiny “moth holes” found in sweaters and other garments. Most people treat these hole situations with cedar blocks,drawer liners or mothballs. The truth is that it usually takes much more than that to rid your home of “moths” and live hole-free. So, here are the facts about moths, how to treat an infestation and protect your wardrobe . Clothes moths don’t like light and are usually not the moths you see flying around. The damage to your clothing is not done by adult moths, but by the larvae of two types of insects: clothes moths and carpet beetles (the latter being more prevalent than moths in most areas of the country). Moths and carpet beetles lay eggs in dark secluded spots and as their Larvae emerge within a few weeks, feeding on your fabric and wreak havoc for months, if not longer. Moth and beetle larvae thrive in clothing that is packed away and carpet hidden under furniture, especially if there are food spills or other attractive scents. With moth larvae, you may find silky webbing or cigarlike cocoons and Beetle larvae leave dried skins behind — like tiny rice grains. For a severe infestation, call a professional. To treat a minor problem in carpets and rugs, buy a spray made for these pests and spot test to make sure it doesn’t affect the carpet color. Apply, following label instructions, anywhere you find traces of larvae or don’t often clean — such as behind bookcases and along baseboards. Treat both sides of the carpet (if not fastened down) and the rug pad. To treat clothing infestations, remove and treat all infested material. You might throw away the most damaged clothing. Dry-cleaning, laundering or freezing your clothing gets rid of moth and beetle eggs and eliminates perspiration remnants and food spills, which attract and nourish pests. Moths and beetles don’t eat items made of synthetic or cotton fabrics, but you should clean those, too, if you store them with woolens. Weekly use of the vacuum and general good housekeeping removes moth eggs and larvae from carpets before they have the opportunity to hatch. Whether packing for or taking items out of storage, your clothes should be taken outside on a sunny day and brushed vigorously, to remove eggs and larvae. Cedar is my product recommendation for on-going treatment of moths and carpet beetles as it uses natural ingredients rather than pesticides which are found in mothballs and moth crystals. Cedar kills moth larvae but does not work on carpet beetle larvae or older moth eggs. Cedar’s effect also fades as the scent does. You can replenish the scent of boards, closets, and chests by sanding the wood lightly or dabbing on cedar oil, but there is no way to know if you’ve added enough. 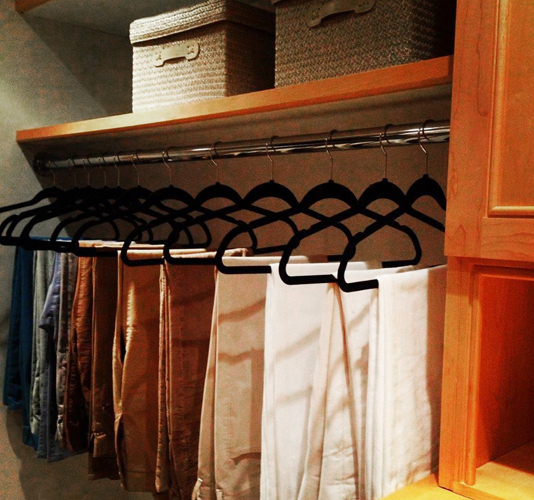 When storing your clothes, reclosable plastic bags or plastic boxes are best for keeping pests out. To protect the items from condensation, wrap them in lengths of clean cotton, and store. Remember that some plastic containers do not allow items to breathe, and some plastics may degrade fabric over time. If storing valuable items, consult with a professional textile conservator for recommendations. Just remember that nothing discourages clothes moths and carpet beetles more than keeping your woolen items clean and storing them correctly.